SACRAMENTO, Calif. /California Newswire/ — This week, Calif. Governor Edmund G. Brown Jr. announced that he has signed a wide range of bills, including AB 1841 by Assemblymember Jacqui V. Irwin (D-Thousand Oaks) – Cybersecurity strategy incident response standards. Additionally, he vetoed a number of bills, including SB 900 by Senator Hannah-Beth Jackson (D-Santa Barbara) – State lands: coastal hazard removal and remediation program. • AB 366 by Assemblymember Rob Bonta (D-Alameda) – Transactions and use taxes: City of Alameda. • AB 806 by Assemblymember Bill Dodd (D-Napa) – Community development: economic opportunity. • AB 1217 by Assemblymember Tom F. Daly (D-Anaheim) – Orange County Fire Authority. • AB 1549 by Assemblymember Jim Wood (D-Healdsburg) – Department of Transportation: state highway rights-of-way: broadband: fiber optic cables. 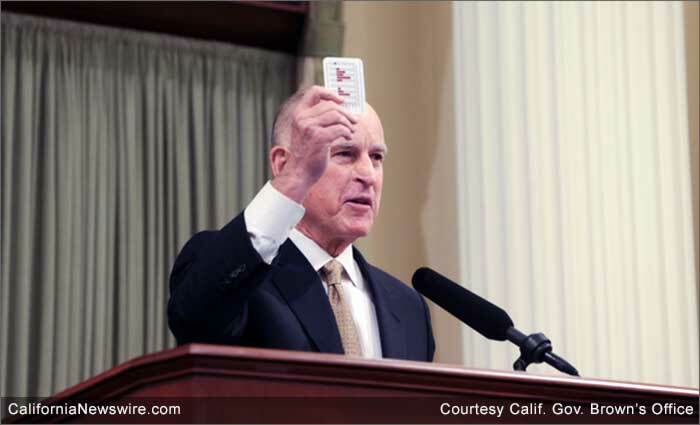 • AB 1755 by Assemblymember Bill Dodd (D-Napa) – The Open and Transparent Water Data Act. • AB 1787 by Assemblymember Jimmy Gomez (D-Los Angeles) – Open meetings: public comments: translation. • AB 1841 by Assemblymember Jacqui V. Irwin (D-Thousand Oaks) – Cybersecurity strategy incident response standards. • AB 1859 by Assemblymember James M. Gallagher (R-Plumas Lake) – Collateral recovery. • AB 1900 by Assemblymember Reginald Byron Jones-Sawyer Sr. (D-Los Angeles) – San Pedro superior courthouse. • AB 1924 by Assemblymember Evan Low (D-Campbell) – Privacy: electronic communications. • AB 1943 by Assemblymember Eric F. Linder (R-Corona) – Parking: county transportation commissions. • AB 1985 by Assemblymember Das G. Williams (D-Santa Barbara) – Advanced Placement credit. • AB 1993 by Assemblymember Jacqui V. Irwin (D-Thousand Oaks) – Law enforcement contact process: service providers. • AB 2001 by Assemblymember Devon J. Mathis (R-Visalia) – Fully protected fish: Owens pupfish: California State Safe Harbor Agreement Program Act. • AB 2007 by Assemblymember Kevin McCarty (D-Sacramento) – Youth athletics: youth sports organizations: concussions or other head injuries. • AB 2106 by Assemblymember Jacqui V. Irwin (D-Thousand Oaks) – Sellers of travel: registration. • AB 2167 by Assemblymember Katcho Achadjian (R-San Luis Obispo) – Vehicles: towed vehicles. • AB 2235 by Assemblymember Tony Thurmond (D-Richmond) – Board of Dentistry: pediatric anesthesia: committee. • AB 2311 by Assemblymember Cheryl Brown (D-San Bernardino) – Emergency services: access and functional needs in emergencies. • AB 2316 by Assemblymember Patrick O’Donnell (D-Long Beach) – School facilities: leasing property. • AB 2346 by Assemblymember Catherine Baker (R-Dublin) – Public social services: hearings. • AB 2446 by Assemblymember Richard S. Gordon (D-Menlo Park) – State Water Resources Control Board: judicial review. • AB 2492 by Assemblymember Luis Alejo (D-Salinas) – Community revitalization. • AB 2542 by Assemblymember Mike Gatto (D-Glendale) – Streets and highways: reversible lanes. • AB 2594 by Assemblymember Richard S. Gordon (D-Menlo Park) – Stormwater resources: use of captured water. • AB 2636 by Assemblymember Eric F. Linder (R-Corona) – Certified copies of marriage, birth, and death certificates: electronic application. • AB 2761 by Assemblymember Evan Low (D-Campbell) – Marriage. • AB 2797 by Assemblymember David S. Chiu (D-San Francisco) – City and County of San Francisco: Mission Bay South Project: redevelopment plan. • AB 2812 by Assemblymember Richard S. Gordon (D-Menlo Park) – Solid waste: recycling: state agencies and large state facilities. • SB 24 by Senator Jerry Hill (D-San Mateo) – California Public Employees’ Pension Reform Act of 2013: joint powers authority: employees. • SB 425 by Senator Ed Hernandez (D-Azusa) – City of El Monte: maintenance of effort: streets and roads allocations. • SB 527 by Senator Carol Liu (D-La Canada Flintridge) – Education finance: Safe Neighborhoods and Schools Fund: Learning Communities for School Success Program. • SB 614 by Senator Robert M. Hertzberg (D-Van Nuys) – Criminal procedure: legal assistance: ability to pay. • SB 866 by Senator Richard D. Roth (D-Riverside) – Veterans housing. • SB 888 by Senator Ben Allen (D-Santa Monica) – Gas corporations: emergency management: leak mitigation. • SB 977 by Senator Richard Pan (D-Sacramento) – Tobacco: youth sports events. • SB 1068 by Senator Connie M. Leyva (D-Chino) – Homeless children and youths: local educational agency liaisons: training materials. • SB 1074 by Senator Ben Hueso (D-San Diego) – Energy: Federal Trust Fund: geothermal projects. A signing message can be found here. • SB 1111 by Senator Fran Pavley (D-Agoura Hills) – State parks: operating agreements. • SB 1121 by Senator Mark Leno (D-San Francisco) – Privacy: electronic communications. • SB 1287 by Senator Mike McGuire (D-Healdsburg) – Fishing. • SB 1302 by Senator Mike McGuire (D-Healdsburg) – Basic property insurance: California FAIR Plan. • SB 1330 by Senator Cathleen Galgiani (D-Stockton) – Missing persons. • SB 1386 by Senator Lois Wolk (D-Davis) – Resource conservation: working and natural lands. • SB 1473 by the Committee on Natural Resources and Water – Natural Resources. • AB 1763 by Assemblymember Mike A. Gipson (D-Carson) – Health care coverage: colorectal cancer: screening and testing. A veto message can be found here. • AB 1853 by Assemblymember Jim Cooper (D-Elk Grove) – County employees’ retirement: districts: retirement system governance. A veto message can be found here. • AB 2691 by Assemblymember Chris Holden (D-Pasadena) – Property taxation: Monthly Property Tax Payment Program. A veto message can be found here. • SB 692 by Senator Andy Vidak (R-Hanford) – Gambling: California Gambling Control Commission. A veto message can be found here. • SB 817 by Senator Richard D. Roth (D-Riverside) – Local government finance: property tax revenue allocations: vehicle license fee adjustments. A veto message can be found here. • SB 900 by Senator Hannah-Beth Jackson (D-Santa Barbara) – State lands: coastal hazard removal and remediation program. A veto message can be found here. AB 453 by Assemblymember Rudy Salas Jr. (D-Bakersfield) – Extraction of groundwater: Semitropic Water Storage District. AB 565 by Assemblymember Ken Cooley (D-Rancho Cordova) – Group life insurance: required provisions. AB 884 by Assemblymember Richard S. Gordon (D-Menlo Park) – Legislature: legislative information: public use. AB 1005 by Assemblymember Richard S. Gordon (D-Menlo Park) – California Beverage Container Recycling and Litter Reduction Act: market development payments. AB 1103 by Assemblymember Bill Dodd (D-Napa) – Solid waste disposal: self-haulers. AB 1348 by Assemblymember Jacqui V. Irwin (D-Thousand Oaks) – State Clearinghouse. AB 1419 by Assemblymember Susan Talamantes Eggman (D-Stockton) – Hazardous waste: cathode ray tube glass. AB 1697 by Assemblymember Susan Bonilla (D-Concord) – Alternative and Renewable Fuel and Vehicle Technology Program. AB 1789 by Assemblymember Miguel Santiago (D-Los Angeles) – Personal income taxes: voluntary contributions: School Supplies for Homeless Children Fund. AB 1811 by Assemblymember Bill Dodd (D-Napa) – Fertilizer: organic input material: registration: inspections. AB 1858 by Assemblymember Miguel Santiago (D-Los Angeles) – Automobile dismantling: task force. AB 1891 by Assemblymember Matthew M. Dababneh (D-Encino) – School districts: special taxes: exemptions. AB 1976 by Assemblymember Jacqui V. Irwin (D-Thousand Oaks) – Food and agriculture: marketing advisory and promotional boards, councils, and commissions. AB 2012 by Assemblymember Frank Bigelow (R-O’Neals) – Jail Industry Authority. AB 2031 by Assemblymember Rob Bonta (D-Alameda) – Local government: affordable housing: financing. AB 2048 by Assemblymember Adam Gray (D-Merced) – National Health Service Corps State Loan Repayment Program. AB 2087 by Assemblymember Marc B. Levine (D-Marin County) – Regional conservation investment strategies. AB 2107 by Assemblymember Jim L. Frazier Jr. (D-Oakley) – Department of Motor Vehicles: electronic vehicle registration services: interstate carrier partnership. AB 2154 by Assemblymember Jose Medina (D-Riverside) – Student Aid Commission: student members. AB 2191 by Assemblymember Rudy Salas Jr. (D-Bakersfield) – Board of Behavioral Sciences. AB 2193 by Assemblymember Rudy Salas Jr. (D-Bakersfield) – California Board of Podiatric Medicine: Physician Assistant Board: extension. AB 2208 by Assemblymember Miguel Santiago (D-Los Angeles) – Local planning: housing element: inventory of land for residential development. AB 2244 by Assemblymember Mike Gatto (D-Glendale) – Court fees: electronic filing. AB 2254 by Assemblymember Katcho Achadjian (R-San Luis Obispo) – Armories: homeless shelter. AB 2258 by Assemblymember Susan Talamantes Eggman (D-Stockton) – Unclaimed property. AB 2306 by Assemblymember Jim L. Frazier Jr. (D-Oakley) – Juvenile court school pupils. AB 2371 by Assemblymember Jim L. Frazier Jr. (D-Oakley) – Voluntary contributions: Special Olympics Fund. AB 2396 by Assemblymember Kevin McCarty (D-Sacramento) – Solid waste: annual reports. AB 2427 by Assemblymember Ed Chau (D-Arcadia) – Civil Procedure: discovery. AB 2430 by Assemblymember Beth Gains (R-El Dorado Hills) – Voluntary contributions: Type 1 Diabetes Research Fund. AB 2568 by Assemblymember Toni G. Atkins (D-San Diego) – County integrated health and human services program. AB 2615 by Assemblymember Jim Wood (D-Healdsburg) – After school programs. AB 2651 by Assemblymember Jimmy Gomez (D-Los Angeles) – Greenway easements. AB 2738 by Assemblymember Kristin M. Olsen (R-Modesto) – School bonds: local school bonds: investment. AB 2859 by Assemblymember Evan Low (D-Campbell) – Professions and vocations: retired category: licenses. AB 2882 by the Committee on Judiciary – Judiciary omnibus: family law. AB 2892 by the Committee on Environmental Safety and Toxic Materials – Pesticide poisoning. SB 122 by Senator Hannah-Beth Jackson (D-Santa Barbara) – California Environmental Quality Act: record of proceedings. SB 441 by Senator Lois Wolk (D-Davis) – California Public Records Act: exemptions. SB 777 by Senator Ricardo Lara (D-Bell Gardens) – The California Finance Lenders Law: application. SB 824 by Senator Jim Beall (D-San Jose) – Low Carbon Transit Operations Program. SB 911 by Senator Robert M. Hertzberg (D-Van Nuys) – California American Indian education centers. SB 984 by Senator Ben Hueso (D-San Diego) – Pilot Program for Increased Access to Responsible Small Dollar Loans: extension. SB 997 by Senator Ricardo Lara (D-Bell Gardens) – Notaries public. SB 1089 by Senator Fran Pavley (D-Agoura Hills) – Wildlife Conservation Board. SB 1120 by Senator Lois Wolk (D-Davis) – Director of General Services: state medical facilities: leases. SB 1128 by Senator Steven M. Glazer (D-Orinda) – Commute benefit policies. SB 1193 by Senator Jerry Hill (D-San Mateo) – Healing arts. SB 1227 by Senator Ricardo Lara (D-Bell Gardens) – California Conservation Corps. SB 1374 by Senator Ricardo Lara (D-Bell Gardens) – The Lower Los Angeles River Recreation and Park District. SB 1384 by Senator Carol Liu (D-La Canada Flintridge) – California Partnership for Long-Term Care Program. SB 1456 by Senator Cathleen Galgiani (D-Stockton) – Safe Drinking Water State Revolving Fund Law of 1997: water systems: financing. SB 1478 by the Committee on Business, Professions and Economic Development – Healing arts. AB 1174 by Assemblymember Susan Bonilla (D-Concord) – Automotive Repair Act: violations: regulations: reports. A veto message can be found here. AB 1588 by Assemblymember Devon J. Mathis (R-Visalia) – Water and Wastewater Loan and Grant Program. A veto message can be found here. AB 1782 by Assemblymember Brian Maienschein (R-San Diego) – Franchises: offer to sell: trade show. A veto message can be found here. AB 1864 by Assemblymember Ken Cooley (D-Rancho Cordova) – Inquests: sudden unexplained death in childhood. A veto message can be found here. AB 2637 by Assemblymember Scott T. Wilk (R-Santa Clarita) – Franchise investments: offer and sale of registered franchises: registration exemption. A veto message can be found here. AB 2730 by Assemblymember Luis Alejo (D-Salinas) – Department of Transportation: Prunedale Bypass: County of Monterey: disposition of excess properties. A veto message can be found here. AB 2747 by Assemblymember David Hadley (R-Manhattan Beach) – Chronic dialysis clinics. A veto message can be found here. SB 547 by Senator Carol Liu (D-La Canada Flintridge) – Aging and long-term care services, supports, and program coordination. A veto message can be found here.